This morning I woke up at 4:49 thinking I had heard something outside. I sat awake, the dark penetrating my entire room. I decided to get out of bed, and check everything. Doors locked, window shut, no sign of anything changed, peace. I walked back up to bed and sat there for a little while. One of my favorite, favorite things is the morning. Waking up with the sun, being present as it takes it’s rise. I went back to sleep, knowing I only had less than two hours before I would want to be awake. And so, it is 6:47 as I write this. I sit at my computer, coffee next to me, warm and sweet. The tumbling noise of the dryer would typically annoy me but it soothes me this morning. The air outside looks still and warm. And of course, the sun is up. I close my eyes for a few seconds: I am so grateful for the simplistic beauties of today. I’ve had a lot on my mind lately. Things that I want to do, places I want to see. Everyday I try to do one thing that is completely for me. 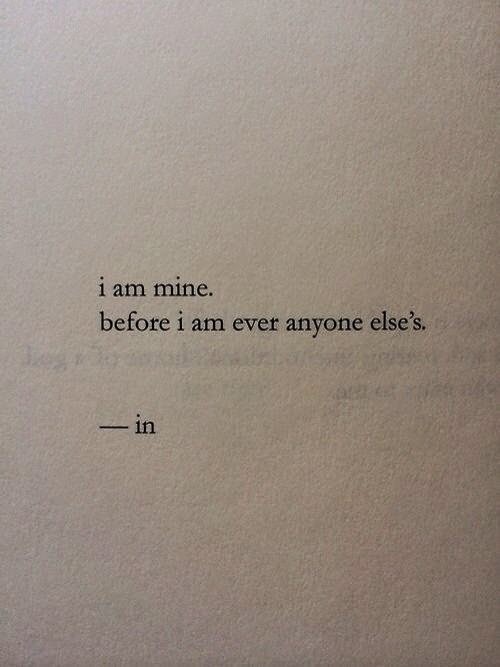 I know that sounds like I spoil myself every day, but I read this quote, “I am mine before I am anyone else’s.” And I just thought to myself: how often do we actually treat ourselves how we would like to be treated? We often give to other’s, our family, friends, co-workers, but how often do we say, I want to do this, so I am going to do it for me? It’s the common theme I see among people’s lives every day. It’s written on their pages. This sadness that everything they do, is for someone else. We are taught at a young age to be kind to others, to share, to love, to sacrifice, and to respect others. And then at some age, we realize that we have done those things for everyone except ourselves. We only realize that we are important when we decide to treat ourselves like we are important. We have to love ourselves before someone else can. We have to take care of ourselves before we can mentally, emotionally, and physically take care of someone else. And we have to set the bar for the kind of love we believe we deserve. If for years you tell yourself you are not worth nice dinners, good conversation, living a healthy life, loving who you are; who else is going to do it for you? Love yourself. And in return, it makes it so much easier to love others. Love yourself, and in return people will find that it's impossible not to love you too. Stop by Anne's blog, Love the Here and Now to share what you are wishing for this week. And Emily's blog, Ember Grey, to share what you are grateful for. xo. I think we all would be happier and emotionally healthier if we took care of ourselves. Thanks for the reminder that it is ok to do for ourselves too! Love this!! Wow. Excellent post. We all tend to go about our days trying to impress other people while we never really focus on what we truly want for ourselves. I love that quote so very much!